It has come to my attention that an update was needed, so here is the NEW Complete Roof Rack Comparison Thread! Hope this includes a lot more useful and clear info than the old thread to make your decision making easier when it comes to choosing the best roof rack option for you! 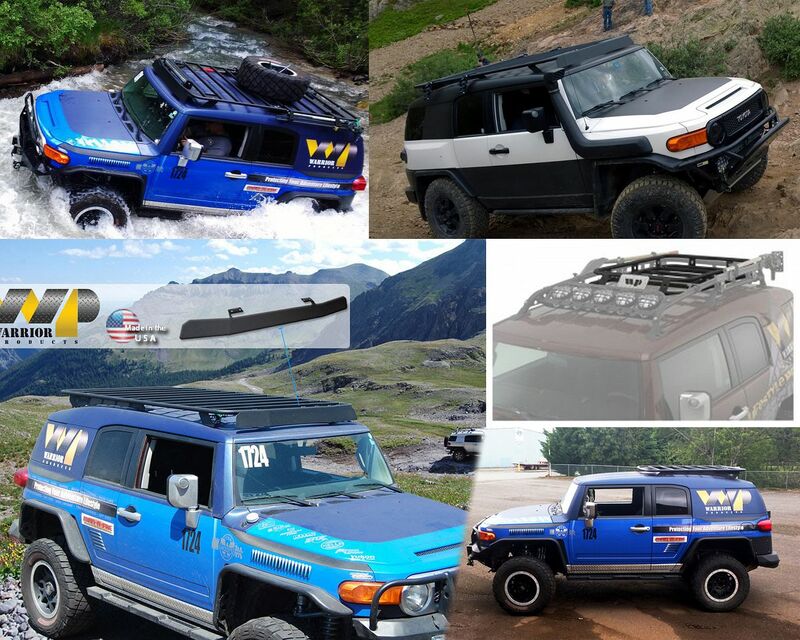 And for the purposes of this thread I wont include basic roof bars like those offered from Thule, Rhino-Rack, or others that aren't true roof racks. Comment in the thread to share your thoughts on roof racks, post pictures of your set-up, tell others about other roof rack options and details, or let me know if I missed something! 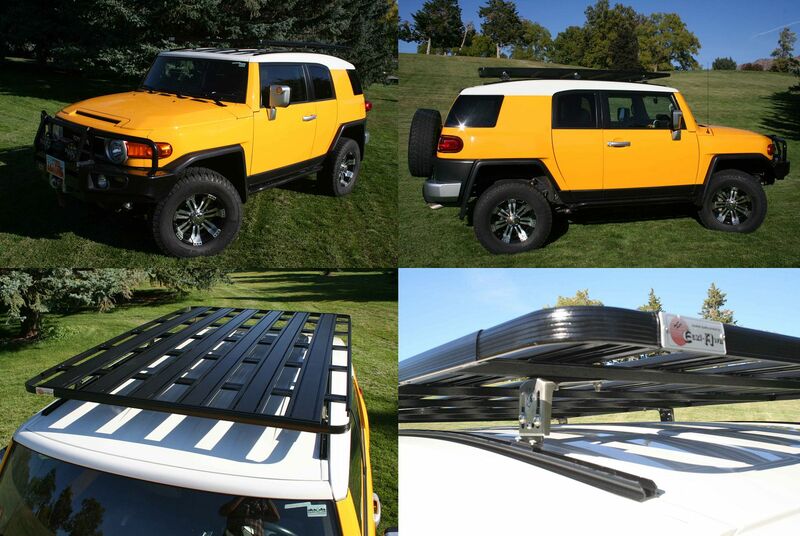 Full – Replaces entire roof rack and extends most of the length of the FJ’s roof. Half - Replaces entire roof rack but is a shorter model that may only extend around half the length of the roof, usually the rear half. Drop-In – This design fits inside the factory roof rack and mounts to the factory roof rack. 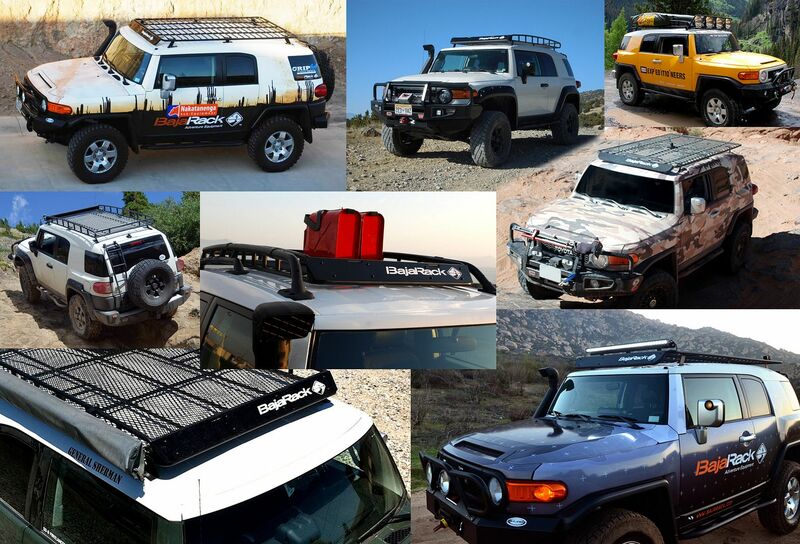 Notes: ARB has 3 main designs of roof racks. First is their standard roof rack (87” x 44”) which is offered in a steel version or aluminum alloy version for those looking to save weight, but the steel version can also come with a mesh flooring. Next is their short roof rack (52” x 44”) which is just like the standard one but only offered in steel and no mesh flooring. And finally is their Touring style roof rack (87” x 49”) with a basket area in the front and flat section on the rear ideal for ARB roof top tents. 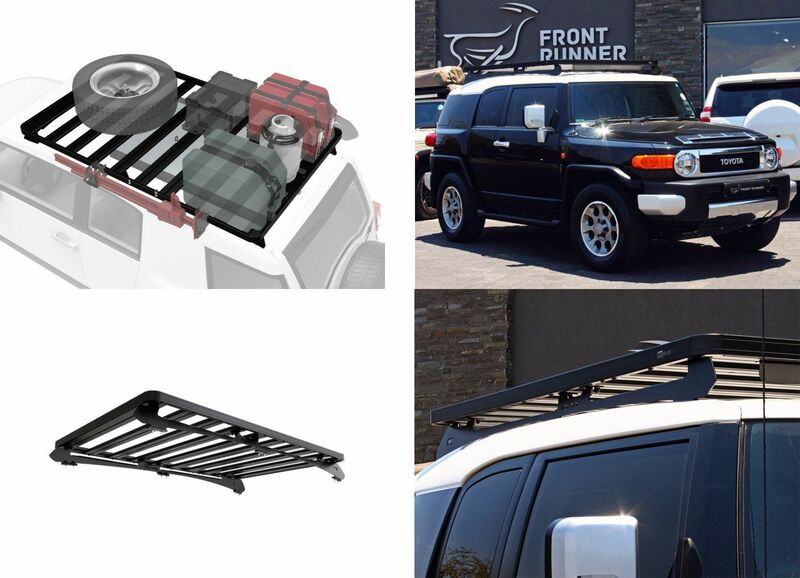 The cheaper of the 2 mounting kits required only works for the short roof rack while the more expensive one is for all other roof rack mounting applications. Notes: BajaRack offers a drop-in basket design that works with OEM roof racks. They also offer Standard Basket racks with or without mesh flooring, Flat Utility racks in a small (51”) or medium (55”) width variation (used to be a large version but they stopped offering it due to its excessive width), a Flat Utility rack with their Spy Light System (has a small motor on it so driver can control a LED light bar that can lower behind the wind deflector or raise up above the wind deflector to shine forward), or their Expedition Rack for roof top tents as the rear section is flat to accommodate a tent and there is a small basket area up front for gear/equipment. Roof Top Tent Compatible: ??? 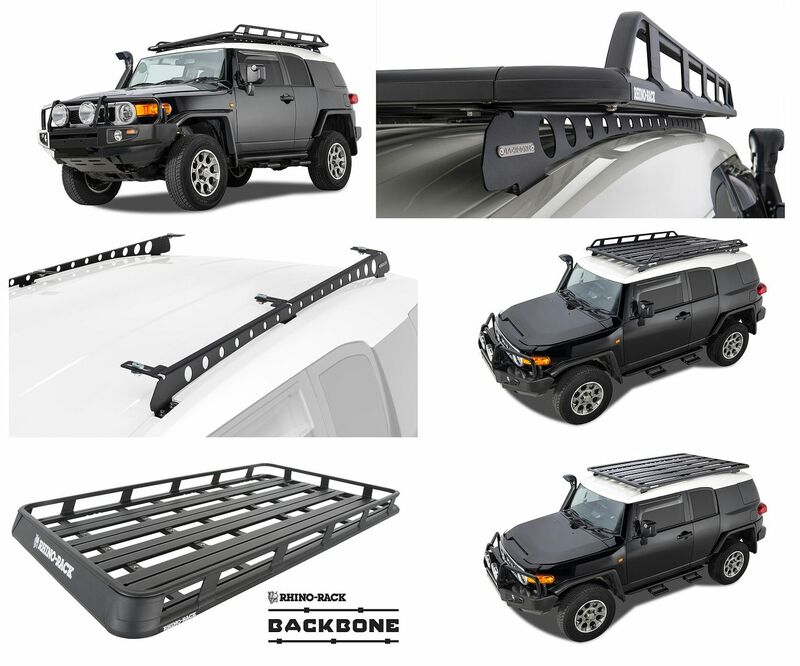 Accessories: Rear Ladder, and they produce FJ Cruiser front and rear bumpers. Notes: Not much information out there. And website model shows the older model, pictured is the new model. Accessories: Compatible with your existing Thule or Yakima sports bar mounts for bikes, kayaks, etc. With a modular system to accommodate shovels, axes, jerry cans, and more. 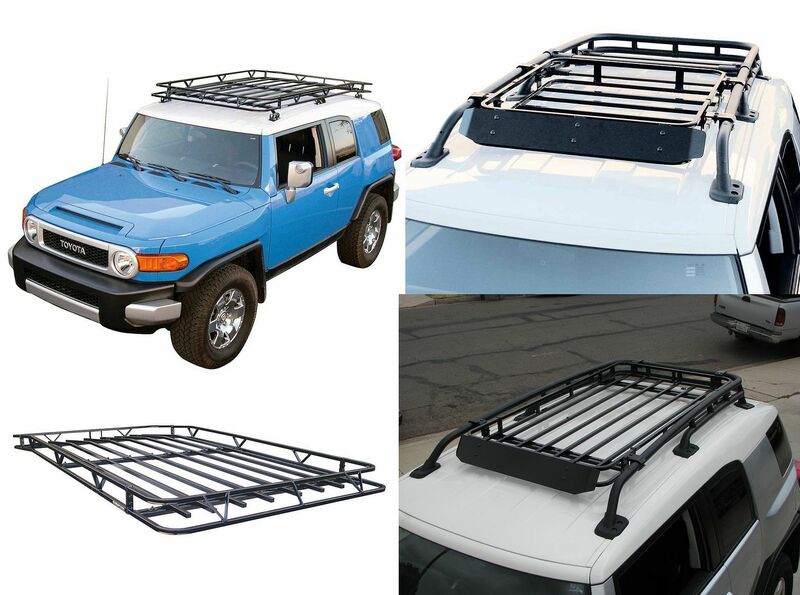 Notes: Multiple full roof racks available in multiple sizes. 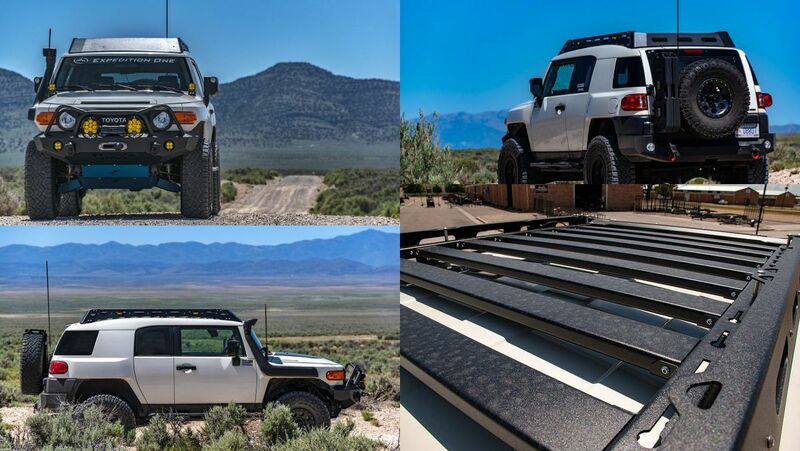 Notes: Front Runner offers their SLIMLINE II ROOF RACK KIT for the FJ. Lots of accessories including slats to fill in the gaps and make a completely flat surface for the roof rack as well as the Expedition Rail Kit to create a basket roof rack design. Notes: Garvin Wilderness offers 2 types of roof racks. First is their full roof rack, the Expedition Rack, Long Version, which is 48"W by 90"L and has 4"H sides. It also contours to the roof towards the rear so isn’t flat the entire length of the rack. 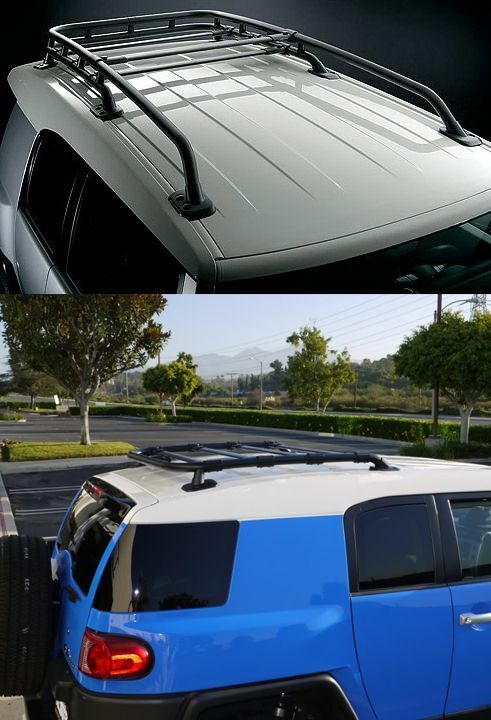 Then they offer Adventure Racks which are drop-ins designed to mount to the factory roof rack. There are 2 versions of the Adventure Rack, first is the standard version which is 35.25"L by 36"L x 5"H and fits towards the front of the OEM roof rack. Then there is the XL version which is 35.25"W by 66'L by 4"H and fills in the whole OEM roof rack area. Garvin also has racks available for the rear cargo area and above the rear tire. Rock sliders are also available. Notes: Gobi offers 2 styles of roof rack, the Stealth and the Ranger, all come with mounting hardware and wind deflector. The Stealth only extends 6.5” above the roof and can be purchased in 2 variations. One Stealth variation allows for 4 small LEDs to me mounted on the front while the other allows for a 40” LED bar. The Ranger extends 8.5”above the roof and also has 2 variations, both built to fit 4 individual lights but one comes with a tire rack. Free ladder and shipping with any rack if in the Lower 48 States. Accessories: Many options available on website. Notes: Base Mounting System must be purchased regardless of rack. Multitude of rack options including basket-style, side-rail style, or flat racks most in different sizes. 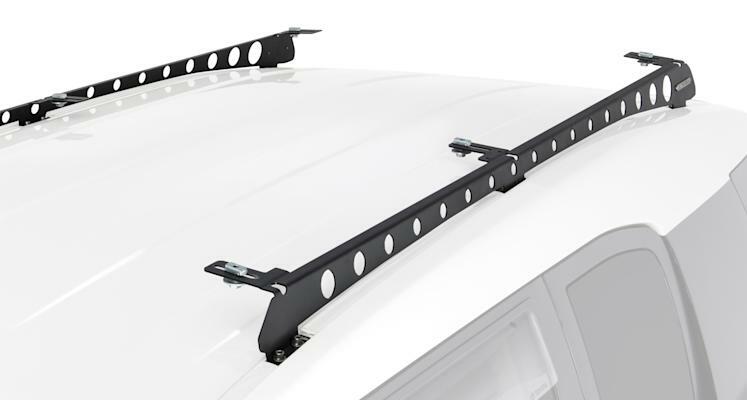 Rhino-Rack also offers options to add cross bars to the factory roof rack. Notes: Not much info is provided on website about this roof rack. Weighs 66.14 lbs and is 72 x 59 x 7 in. 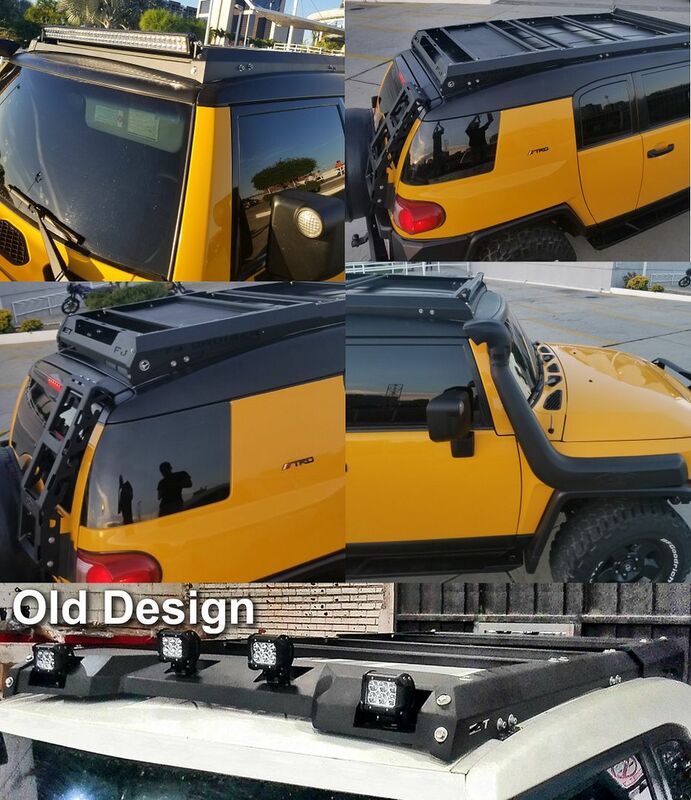 Light Mounts: No - unless Pre-Runner light bar accessory is added, fits five 6.75″ round lights, but Warrior states "designed with open front for an ideal place to mount lights without taking up space on the rack"
Roof Top Tent Compatible: Yes, for full and possibly half racks. Notes: Warrior Products' full roof rack measures 89.5″ Long, 51-1/4″ wide, and 5″ high with a weight of 90 lbs. The half rack is 57-1/2″ Long, 51-1/4″ wide, and 5″ high with a weight of 82 lbs. And the drop-in cargo basket which includes mounting system to sit inside OEM rack is 51 inches long , 35 1/2 inches wide, & 5 inches tall. Many optional accessories available. chikwaters, NyNomad, GammaBruiser and 8 others like this. Last edited by FJX2000; 01-29-2019 at 04:26 PM. Awesome! Can't wait to see the updated front and rear bumper comparisons! I love my Warrior Products Full length flat rack!!
" You can't be afraid to scratch it "
The demand was certainly there at one time for these racks and they look great, but do you have confirmation both from All Pro and from anyone who has bought/custom ordered one in the last year and had it delivered timely. I think All Pro has good stuff....I am just VERY skeptical that the FJ rack can even be ordered and delivered. I'll ride in on a sunny day, Sing you a song, steal your heart away Like a cowboy Hang my hat like I'm here for awhile Kick off my boots and drive you wild Like a cowboy Well baby you know I can't stay long You wake up, I'll be gone Until then I'll hold on Like a cowboy. Yeah...i get that....but still because of alphabetical order, they get top billing. Same reason there are so many service companies with AA AAA AAAA in their name..at least from the old "yellow pages" days. It seems like an OK way to order the listing of racks (alphabetical), but my real concern is that by sheer virtue of their name they get 'top' billing and I don't think the rack actually exists. I will stand down if someone can point me to recent deliveries of these phantom racks. And, trust me I have nothing against All Pro. I just cant believe the amount of demand for something that basically just disappeared from the market. 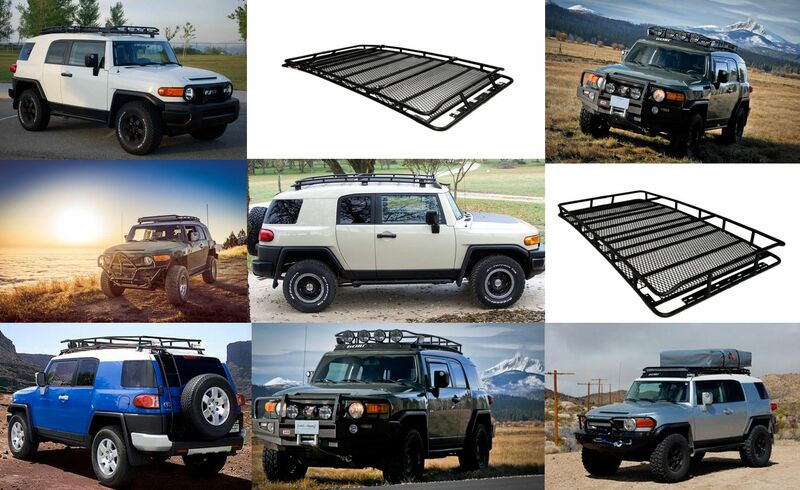 I have been on the FJ forum since 2009 and in my mind the "we'll have a rack out soon for you" has become a running joke for the old-timers on the forum. I certainly haven't searched for every thread, so I am definitely open to the possibility that I am just not up to date on their current offerings and will happily delete or remove my comments in this thread if they actually exist and can be purchased/delivered. You can add Rhino Rack as well. The front and rear bumper threads are updated, pm me if there are specific details you know need to changed. Yeah it is just a matter of alphabetical order with it showing up first. I will send a message to All-Pro though and see what I can find out about availability but when I talked to them at this last FJ Summit they say they don't list it on their site since it costs more to make a rack in than they get in return, but that you can still contact them and order one. I thought about it but it really isn't a true roof rack like those listed, just misc. cross brace options that a generic basket designs sit on. Last edited by FJX2000; 04-08-2017 at 09:40 PM. 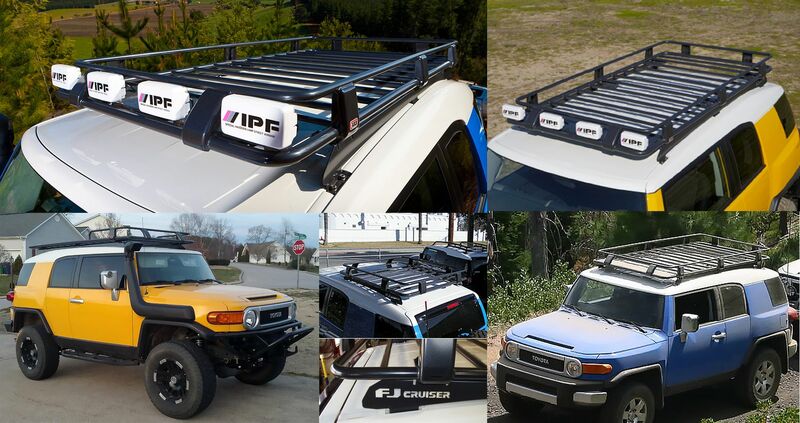 Well I just heard back from All-Pro and it turns out they no long offer their FJ roof rack. I changed the info to not available in the comparison listing and I may keep the All-Pro listing there if folks aren't too opposed to it since it is such an iconic roof rack and that way people can see it. Ahh that does look nice! See I couldn't find anything like that on their website, so do you have a link by chance? I'd happily add it to the listing. Their website search function was a little odd for me so I never saw something like that. I think it is a new option for them. They make vehicle specific for FJ, Landcruiser, Tacoma, Land Rover, Wrangler JK 2 and 4 door, and soon will offer 4runner according to the ad in the new Overland Journal. Here us what the ad says. From there you can add a flat rack or one with side. A few different sizes. Last edited by 2010armygreen; 04-10-2017 at 07:49 PM.